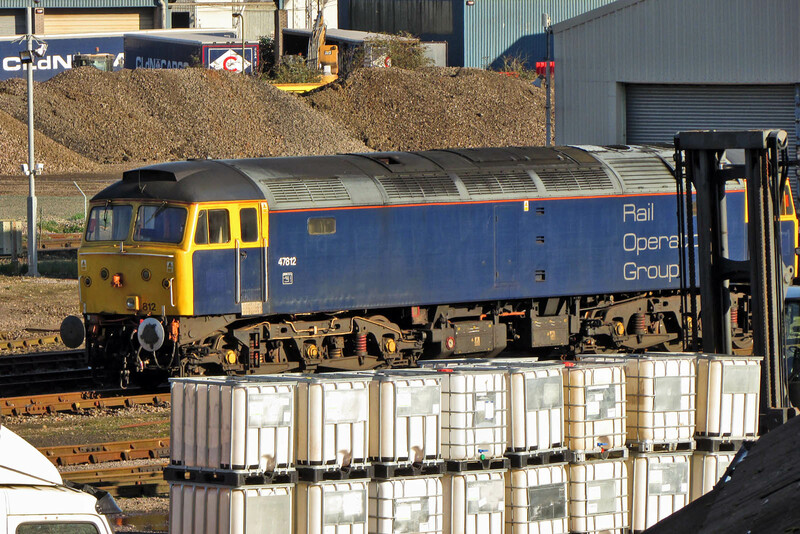 Stored 47812 at Eastleigh Works, 25th October. 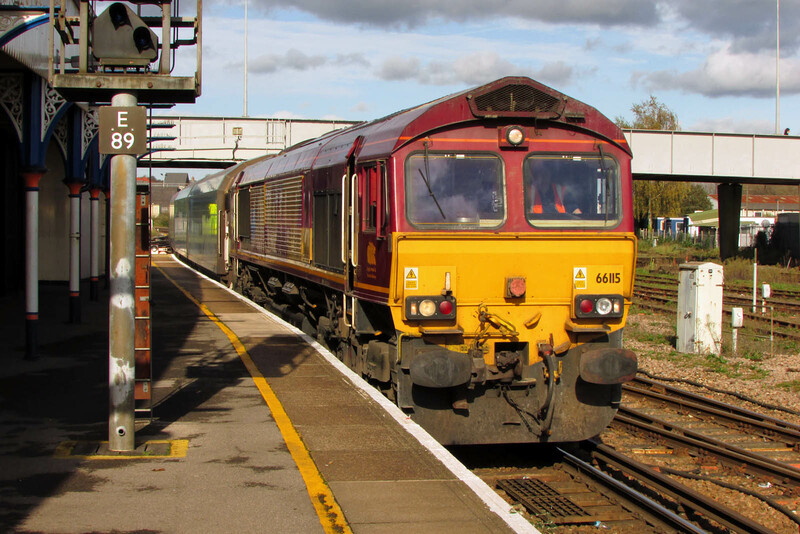 66115 with a single set of car carriers, going into the T&RSMD, having arrived from Hinksey behind 66536, 25th October. 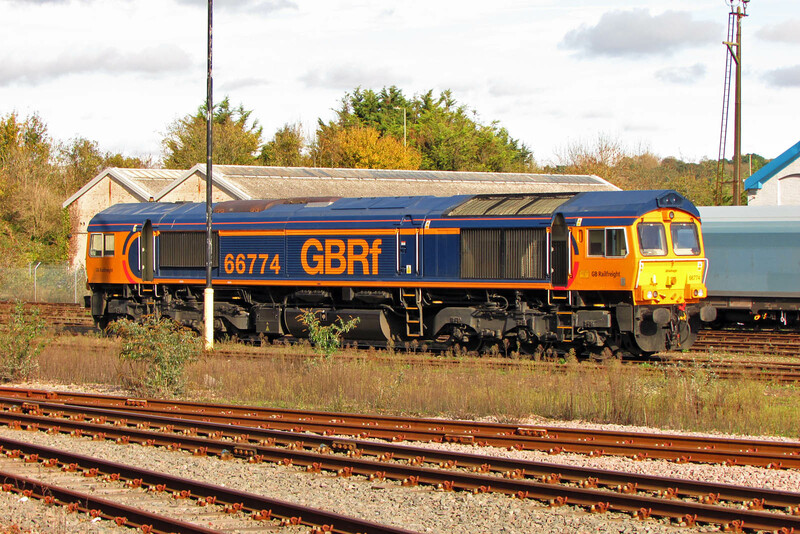 66774 at Eastleigh, 25th October. 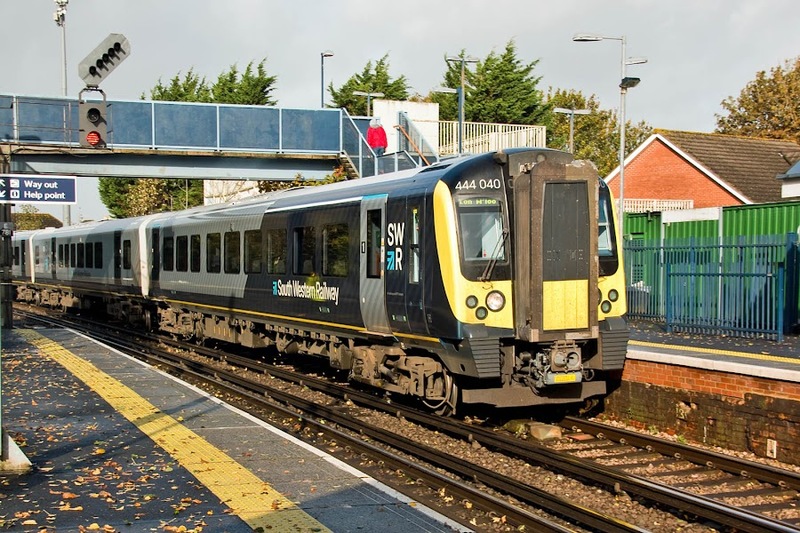 Saturday 28th October: "Major delays after train breaks down in Eastleigh"
L92 (5786) running onto the train at Buckfastleigh. Running around at Totnes Riverside. 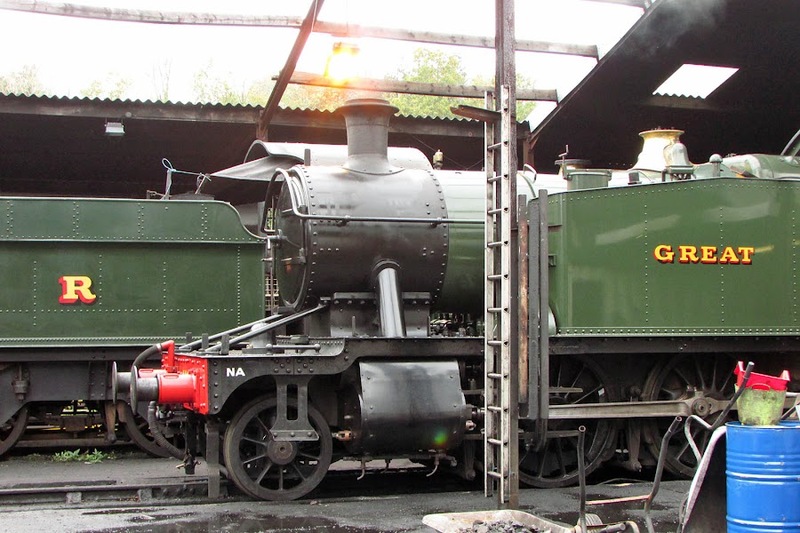 4920 Dumbleton Hall in storage. A stop while running on the branch to drop off a track gang. 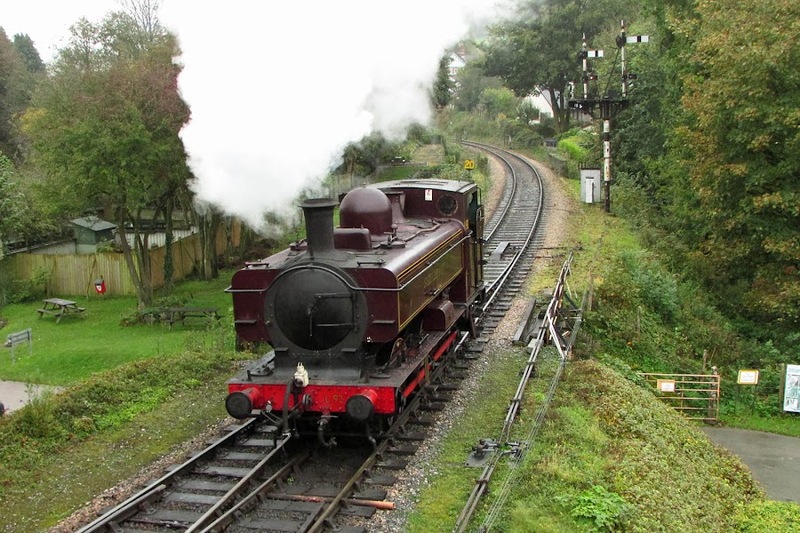 5526 raising steam at Buckfastleigh. My first sighting of a Clayton since the 1960s. As a youngster then, I remember how noisy they were in their BR ScR service. 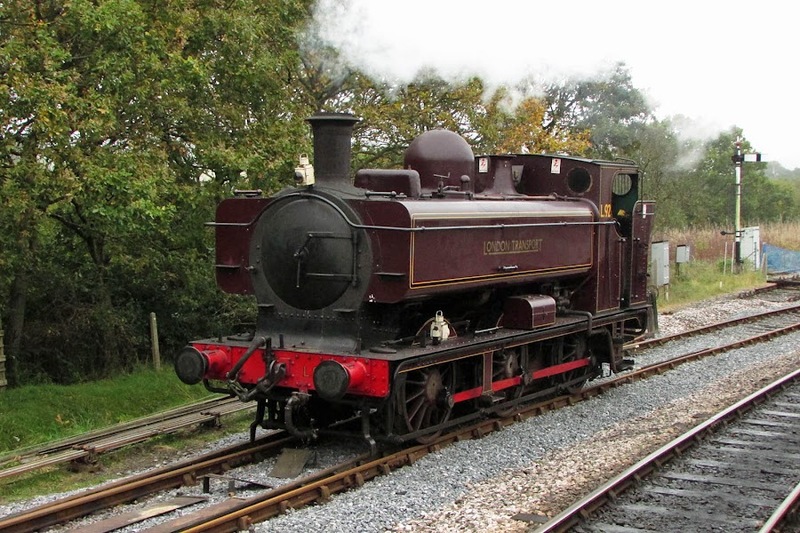 Unfortunately I am yet to be able to see the preserved locomotive working. 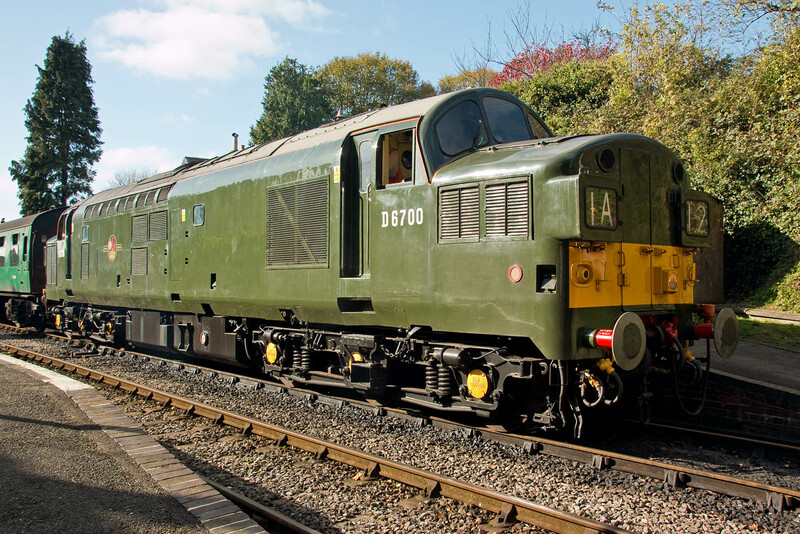 D8568 was completed by the Clayton Equipment Company, and allocated to Haymarket 64B from 6th January 1964. 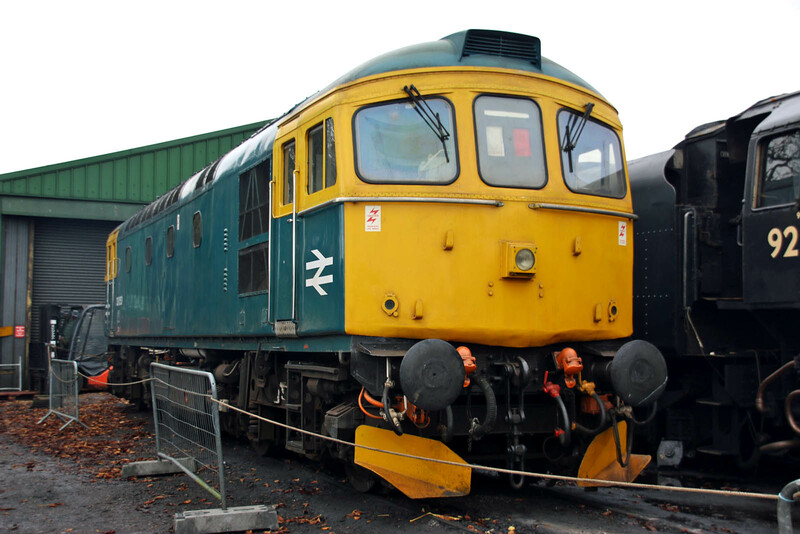 Reallocated to Polmadie in September 1968, and withdrawn on 6th October 1971. 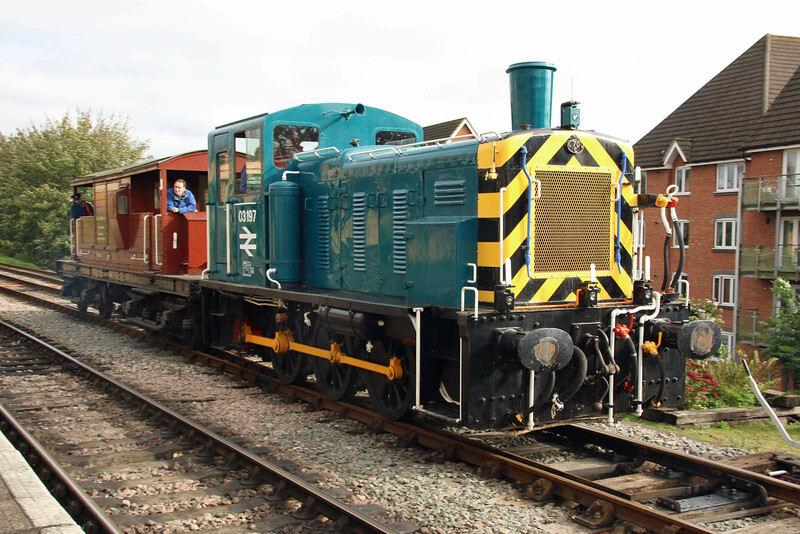 After working in industrial service at Hemel Hempstead, it is now preserved by the Diesel Traction Group. 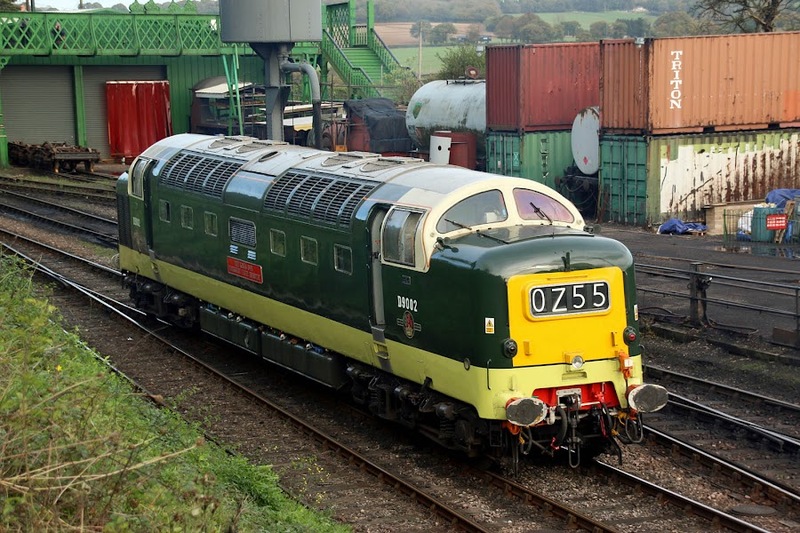 Currently at the South Devon Railway where it has arrived in advance of their Diesel Gala from 3rd to 5th November. The locomotive has already seen some trial use on the railway. 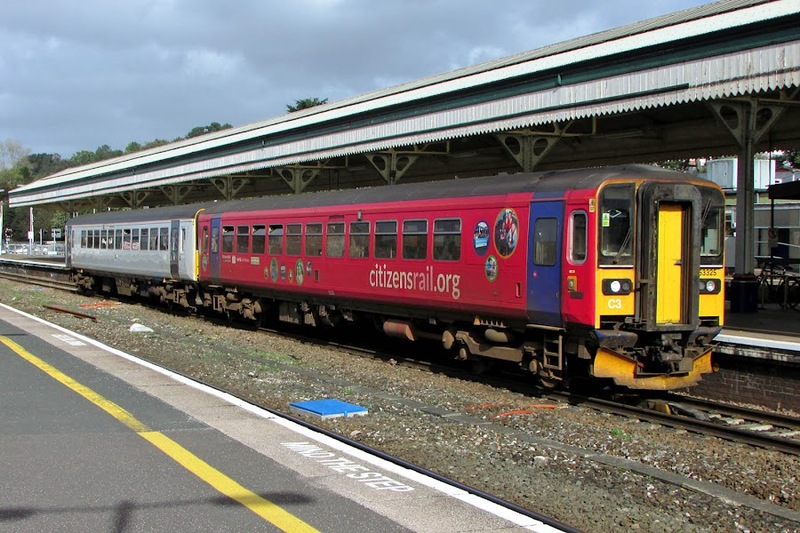 The increased 30 minute frequency of local service between Paignton, Newton Abbot and Exeter follows from a marketing campaign under initiative from "Citizens' Rail" which is supported by EU Interreg IVB . 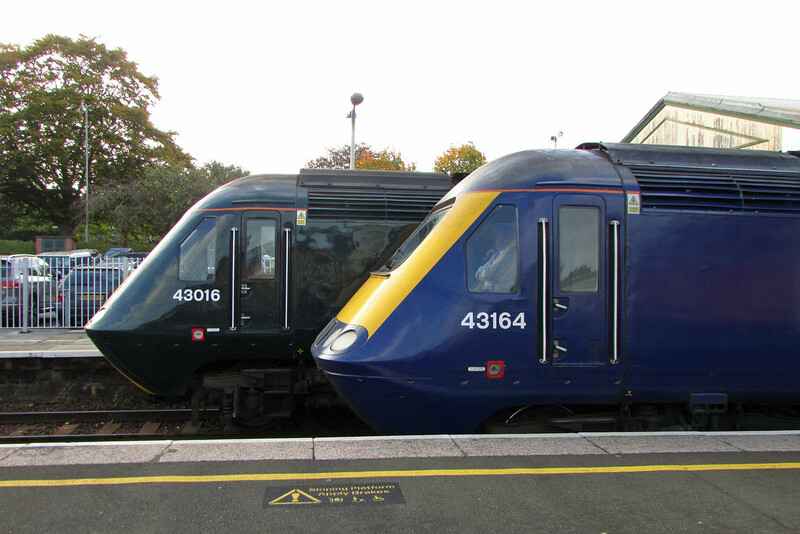 153325 and 153305 at Exeter St Davids, 16th October. 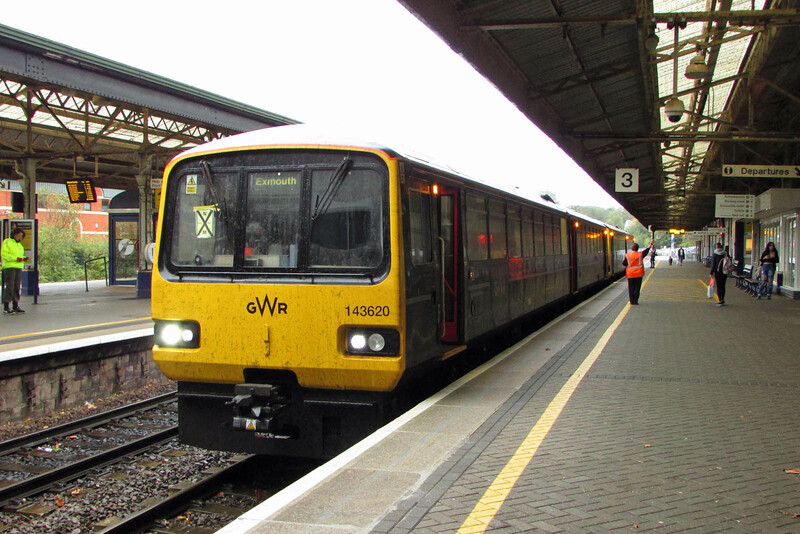 143618 at Exeter St Thomas, 16th October. 143620 at Newton Abbot, 17th October. 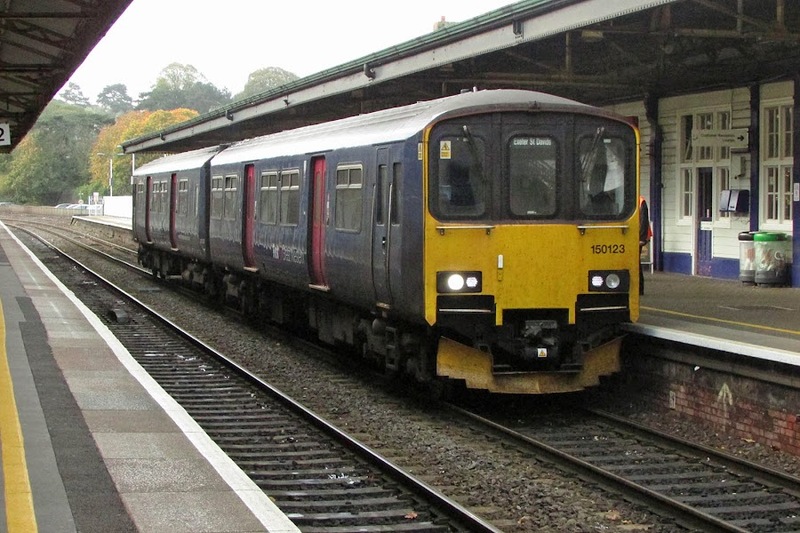 150123 at Newton Abbot, 17th October. Now, I am but a passer-by, with no qualification to discuss the railway history of Newton Abbot, but some notes and miscellany from earlier this week. A useful map of Newton Abbot railways in the 1950s. 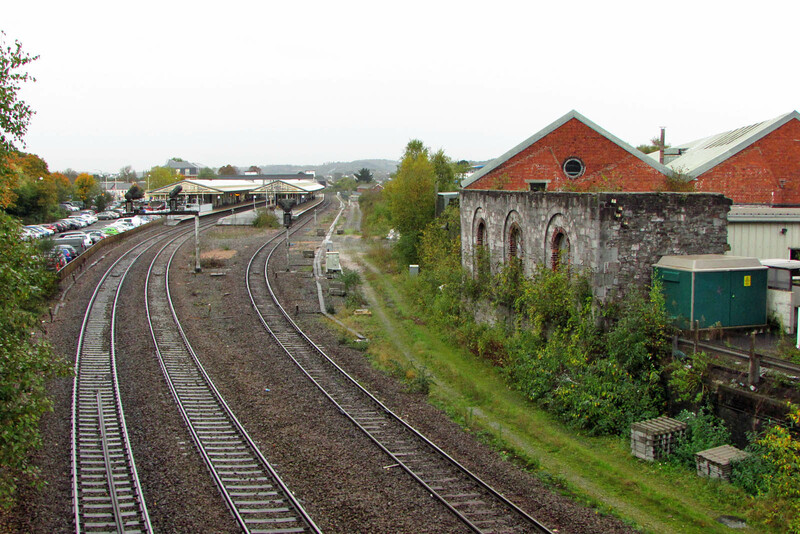 The west end of Newton Abbot station, a much rationalised facility compared with even the 1980s when the remnants of MPD and 'factory' were still present. 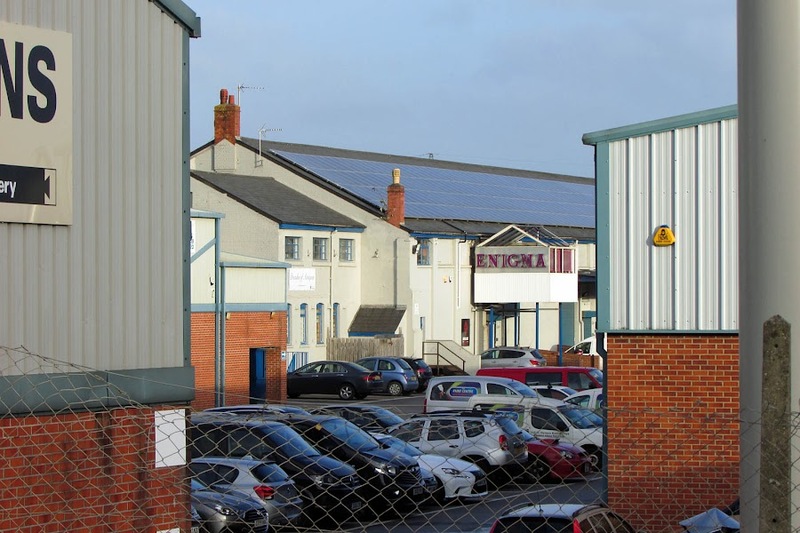 The former South Devon Railway faclities on the right became part of a site used by publishers David and Charles, although their successors F&W Media have now vacated the site, and it is under a plan, not yet fully agreed, to become an Aldi, which will involve the removal of at least some of the "heritage" seen on the right. 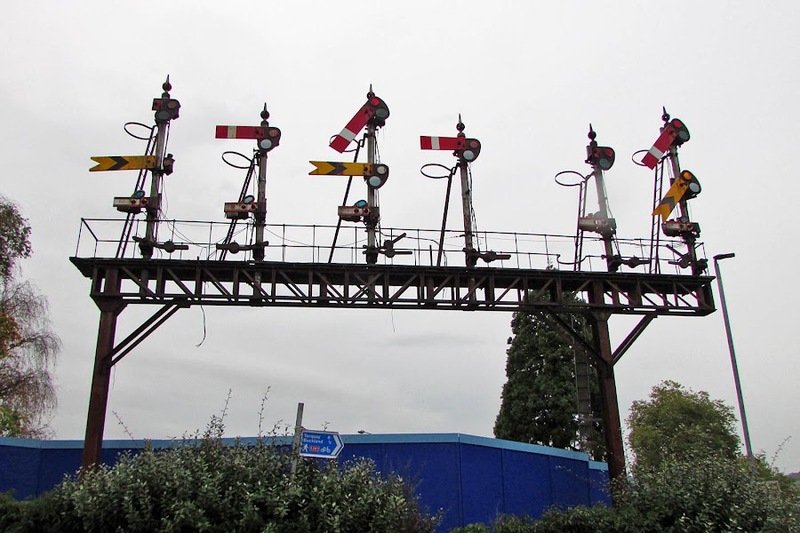 This gantry of signals is from the west end of the station, and was relocated to feature outside of the David & Charles premises. 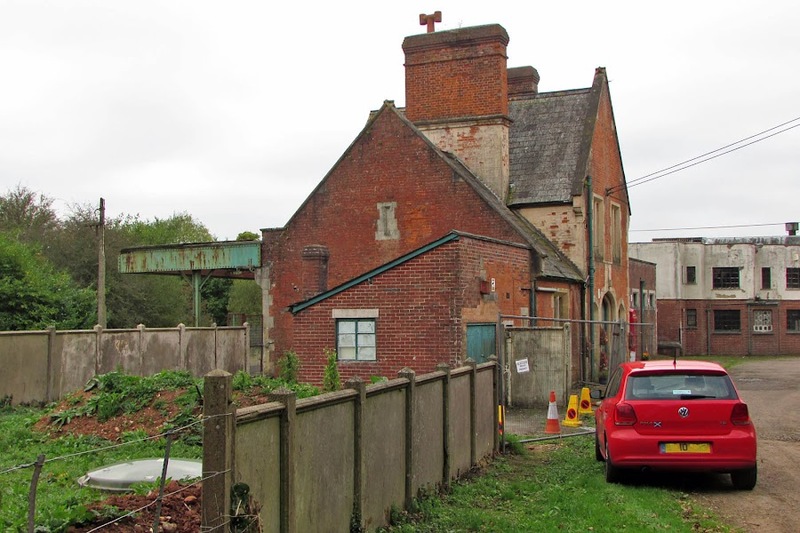 It is located on a ransom strip owned by the council, and intended to be retained as part of the Aldi development. While visiting the town museum, I was told that the ownership would be passed to them, and that the South Devon Railway (Buckfastleigh) team may assist with some maintenance and conservation. Some arms have been removed since 2012 and earlier this year. 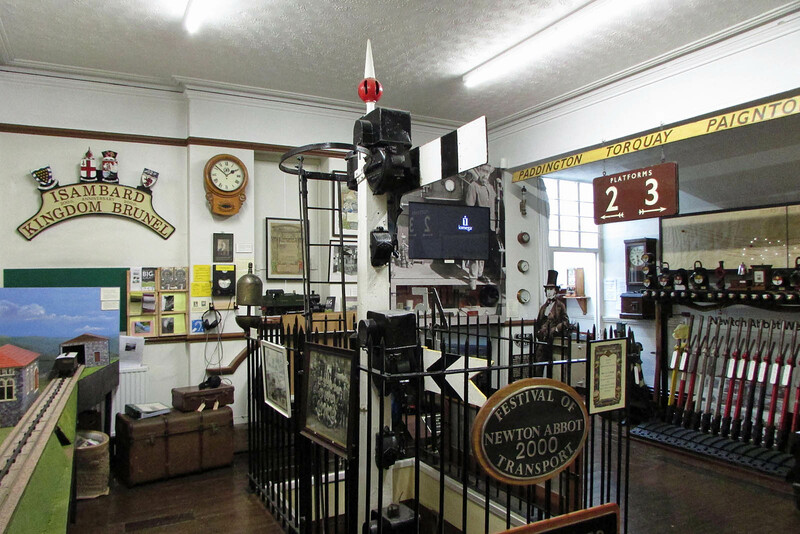 Newton Abbot has a small Town and GWR Museum, well worth a short visit. It may move in the near future into the future "Newton's Place". 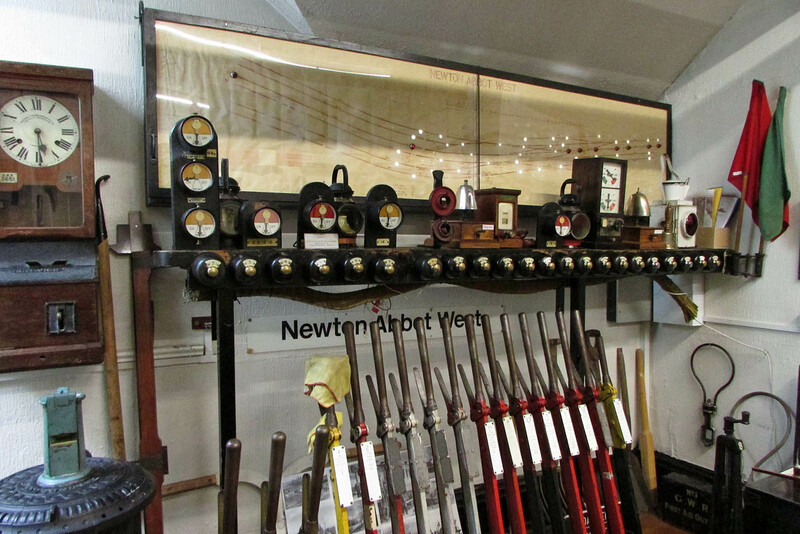 There are many nuggets within one room, including part of frame and signalling equipment from with Newton Abbot West signal box. 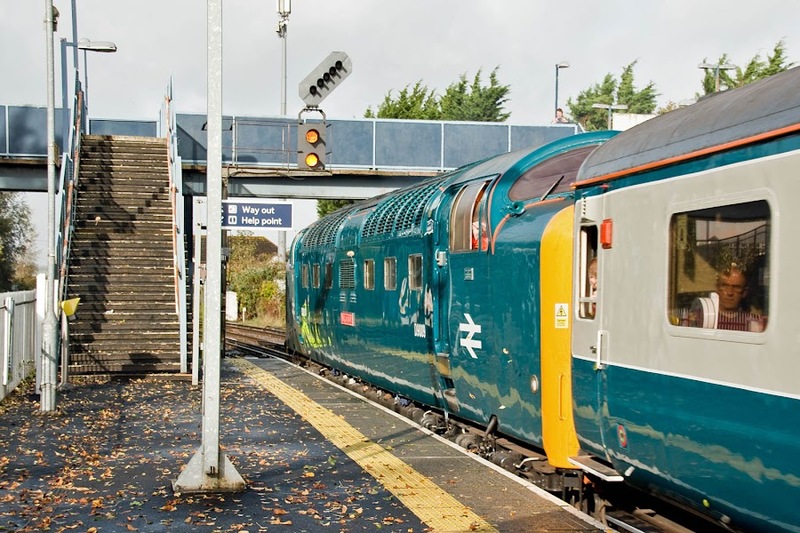 A discussion of the historic signalling at Newton Abbot. A further view of the exhibits, which include a section of South Devon Railway atmospheric railway ducting (hidden), and the factory hooter from the railway works (just to left of centre). In 1911 the GWR moved the goods station to a location on the Moretonhampstead branch line - which also branched to the Teign Valley Railway which ran inland to Exeter. The 1911 goods station still stands, as the Enigna nightclub, the remainder of the yard being the Olympus Busness Park. 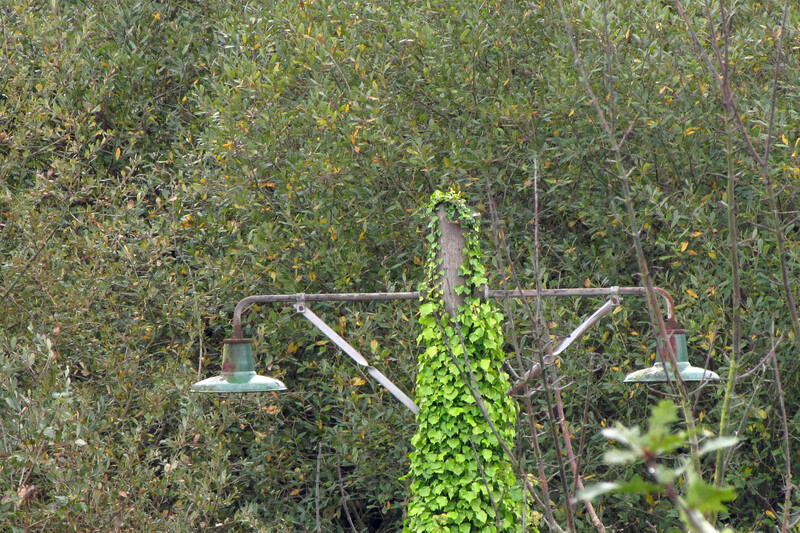 Railway style lamps still present at the lineside. 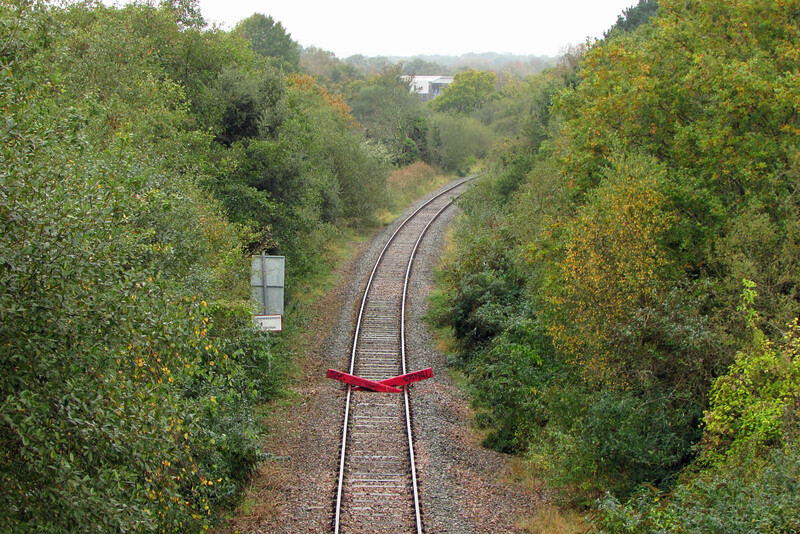 End of the line, on the Moretonhampstead branch, for the meantime anyway, just west of the Kingsteignton Road, although it is intact to Heathfield. 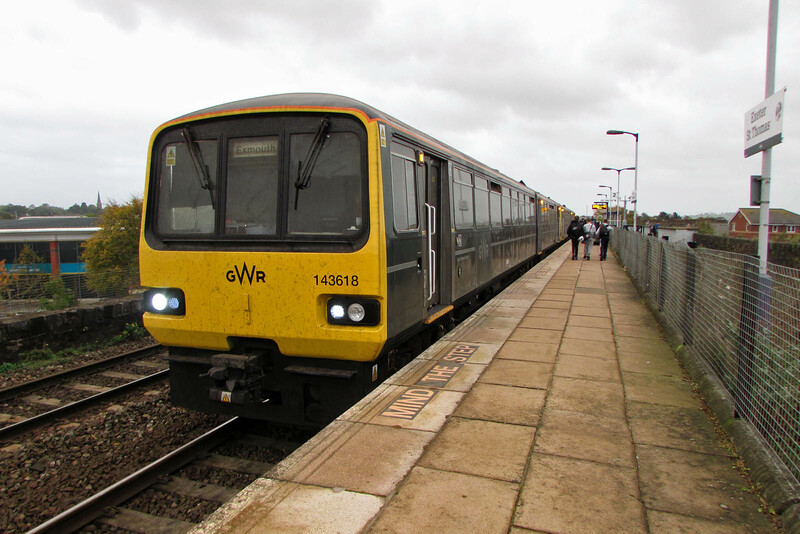 The line appears in good fettle since it was used for Colas Rail operated timber trains to Chirk from 2011 to 2015, but this traffic has now been moved to Exeter, and Network Rail have again placed into a mothballed status. 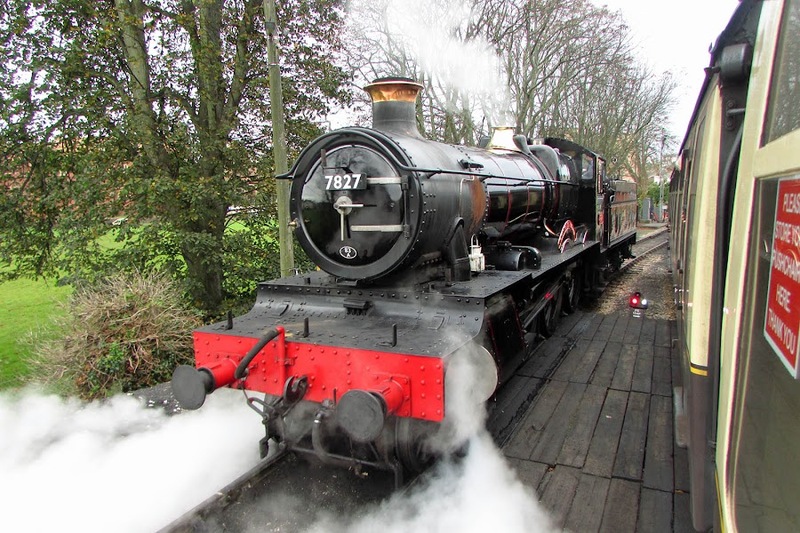 21st December 2014 "Yuletide Tracker" which ran onto the branch. 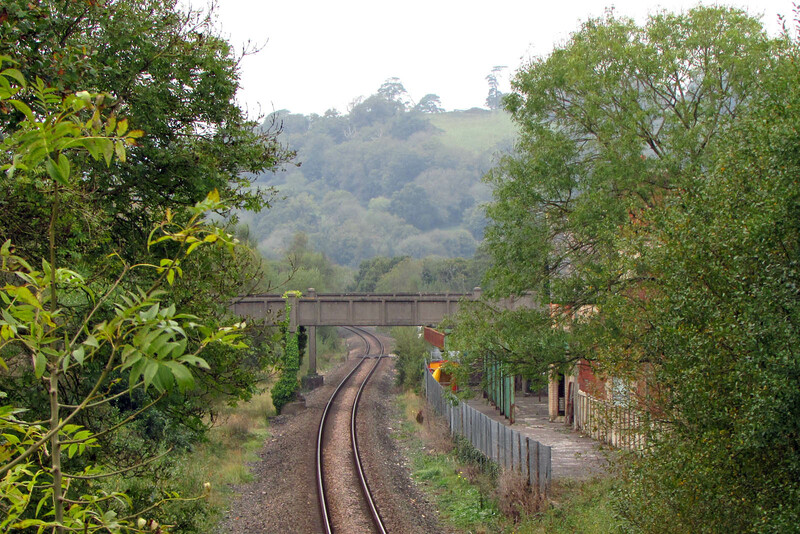 Study to see if reopening disused railway line is feasible (22nd August) "We want to work with train operators to be able to run a train service from Heathfield to Newton Abbot and we are forming a committee to have a look at our next move." Network Rail to consider plans to reopen the Newton Abbot to Heathfield railway line (11th October) "Nearly 3,000 people have signed a petition in support of the plans"
A day in the drizzling rain at Paignton, Kingswear and Dartmouth. 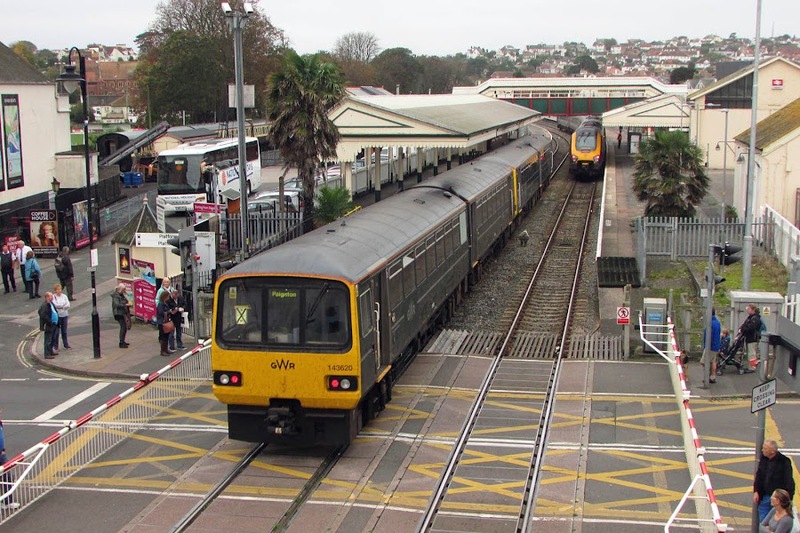 143620 is part of a Pacer arriving at Paignton. 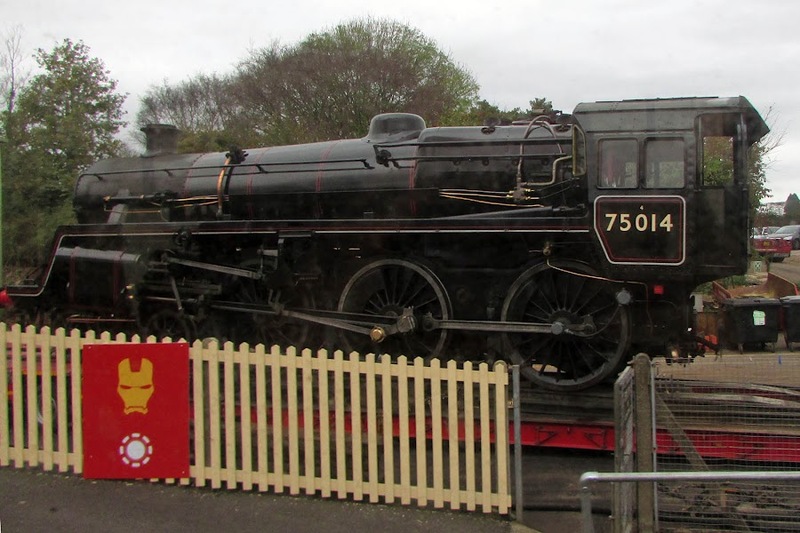 7827 Lydham Manor moves to join the train at Paignton. 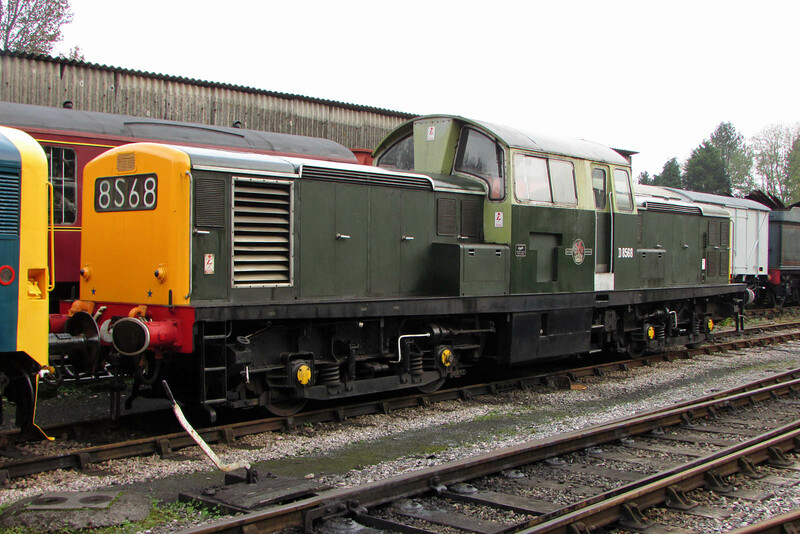 D3014 Samson and D7535 MERCURY (25185) at Paignton. The Class 08 was withdrawn in October 1972 before BR renumbering. 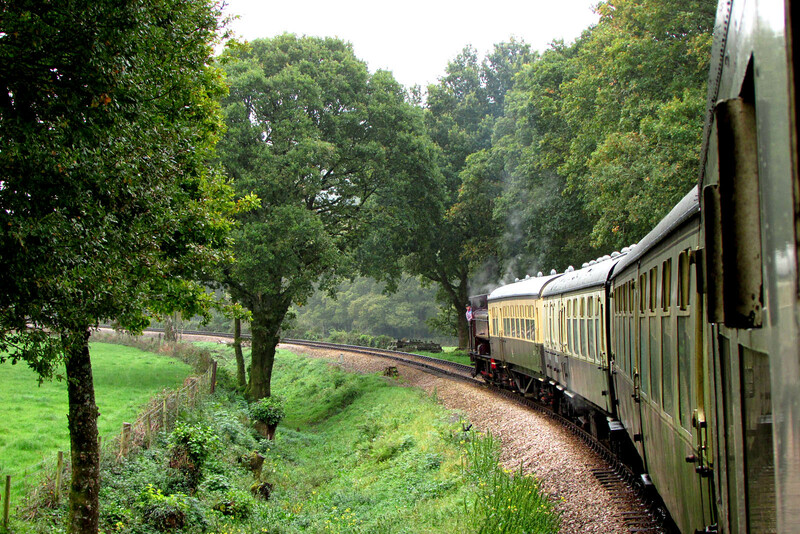 The climb was slow, with slipping on a difficult rail. 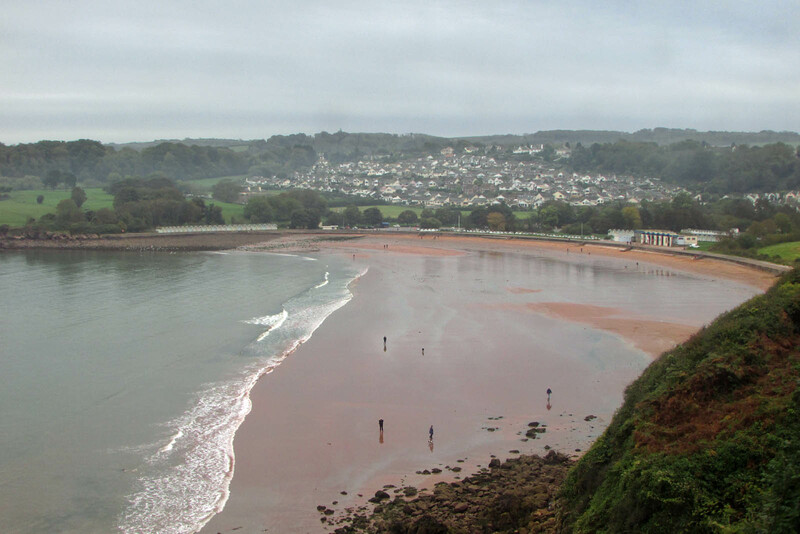 The views were rewarding, such as this one over Broadsands. 75014 BRAVEHEART was loaded onto a road transporter at Churston, apparently returning from the West Somerset Railway where it was a guest locomotive. The strange symbols were all over the railway, I think related to forthcoming Half-Term and Halloween. 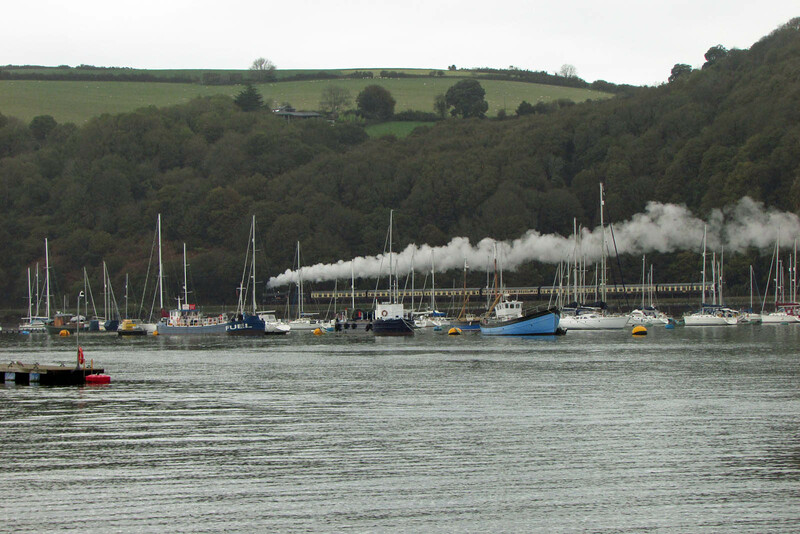 7827 departs from Kingswear, as seen from Dartmouth. 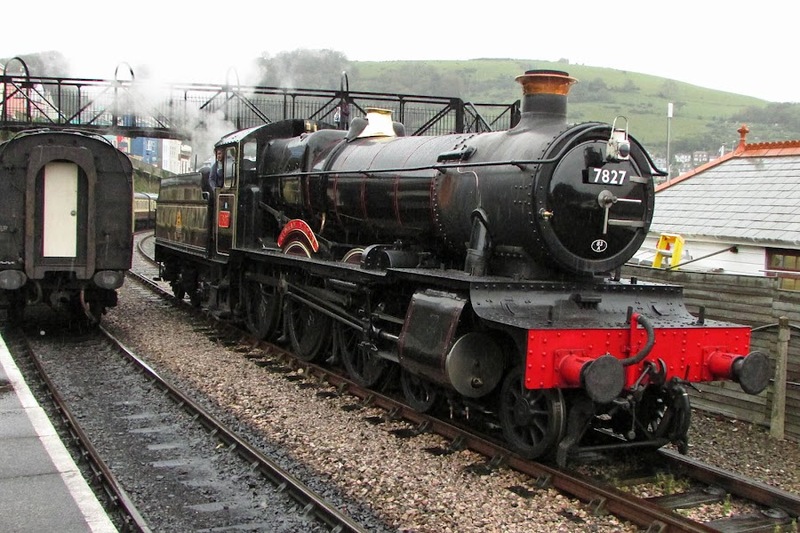 7827 running around at Kingswear. The railway company also manages buses and ferry boats. 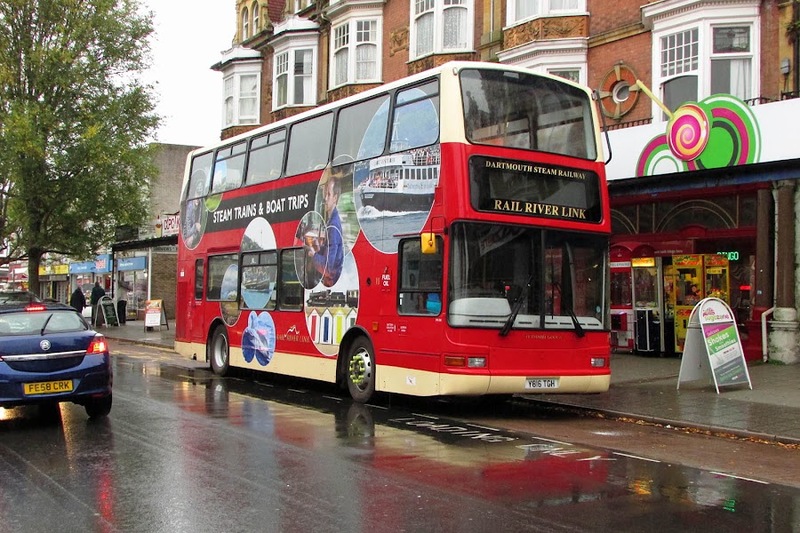 Y816TGH (Volvo / Plaxton) is former London Central PVL216 and Plymouth Citybus 439. 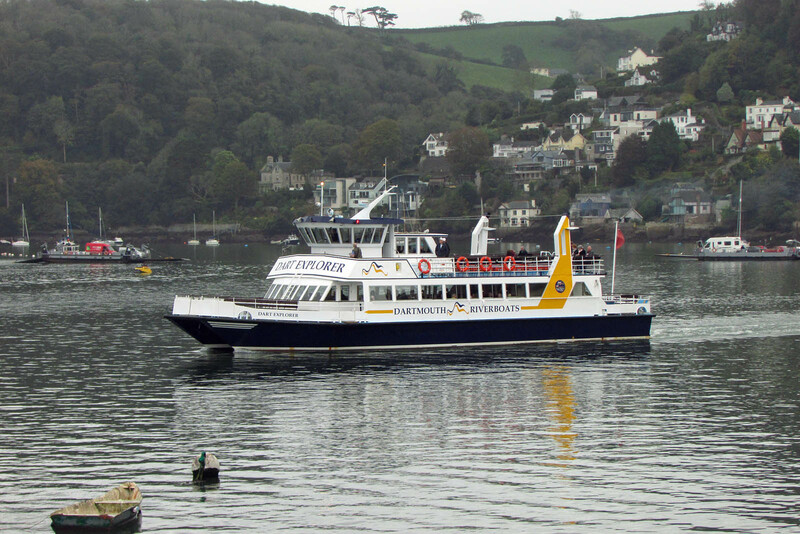 Dart Explorer ran a ferry crossing to meet the train, now seen departing on a cruise. 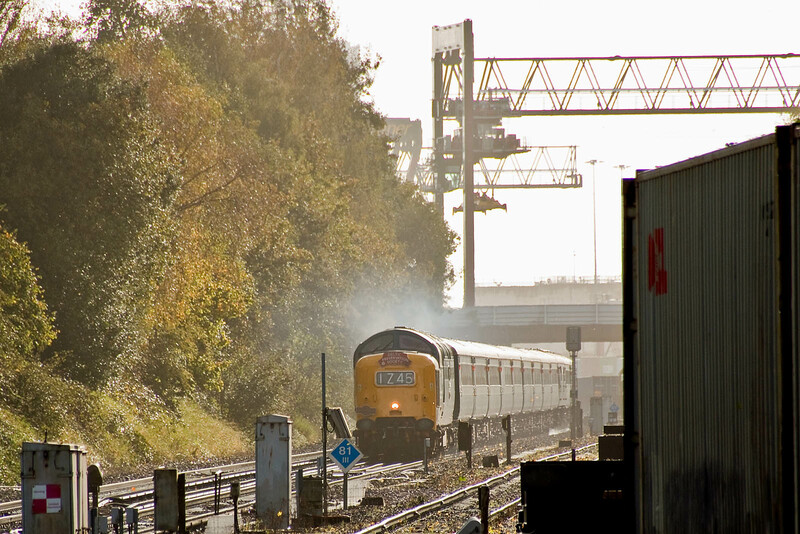 55009 with "The Swanage Belle"
55009 approaching Redbridge from Maritime. 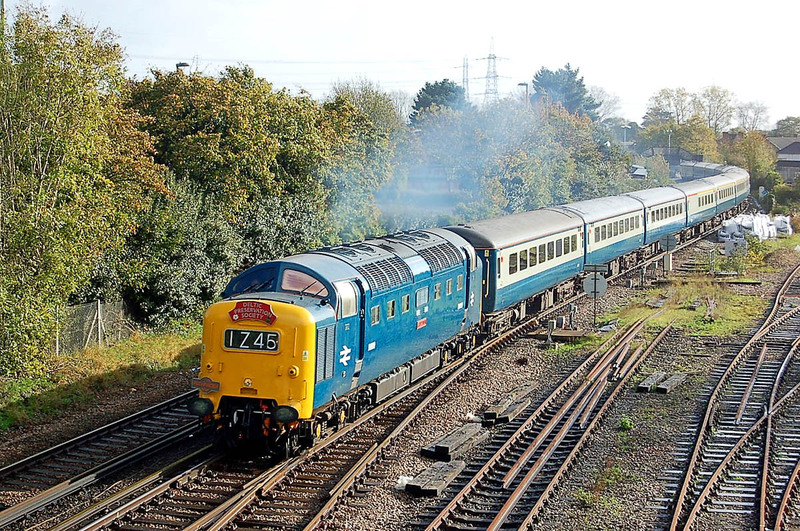 Passing Totton about a minute later. Image by Ian Knight. 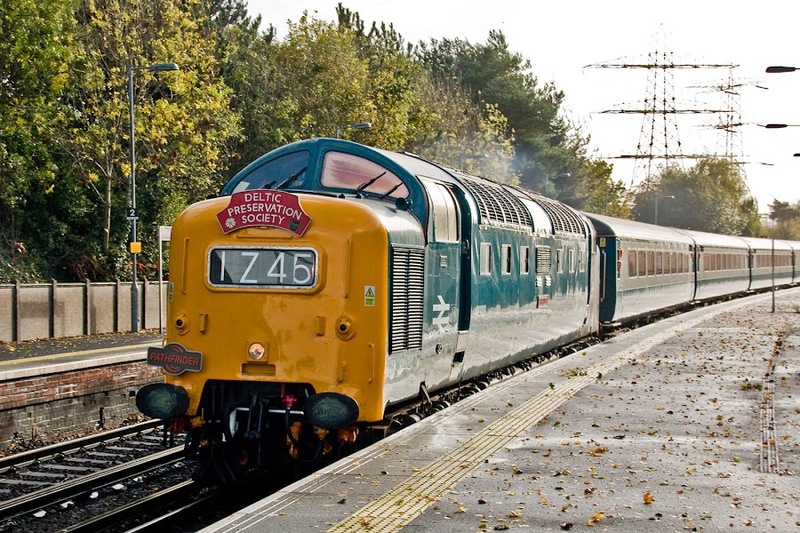 "Drab 444" 444040 passing Redbridge, 21st October. At some recent time,the signal has been changed to a LED unit. 55002 (D9002) had what I understand was an AWS related fault. 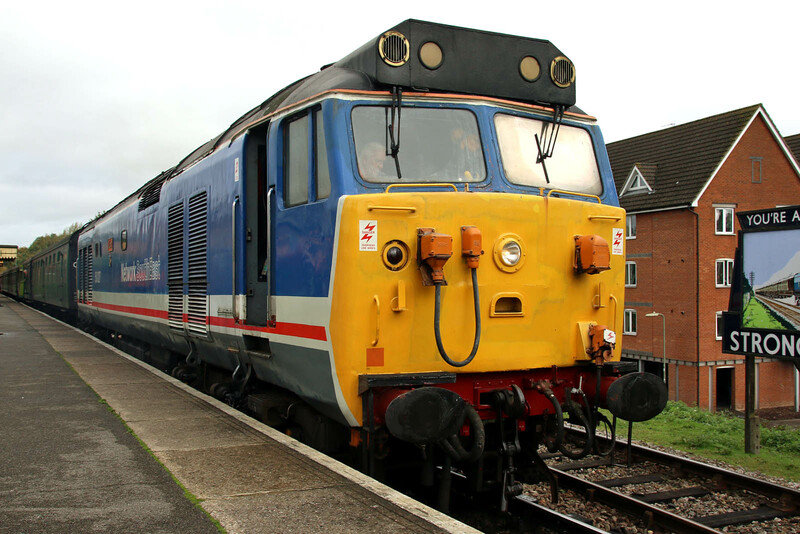 The part was in delivery but went to Alresford, Essex by mistake, 55002 managed to play a part in the gala by borrowing the equivalent from D6700 later in the day. 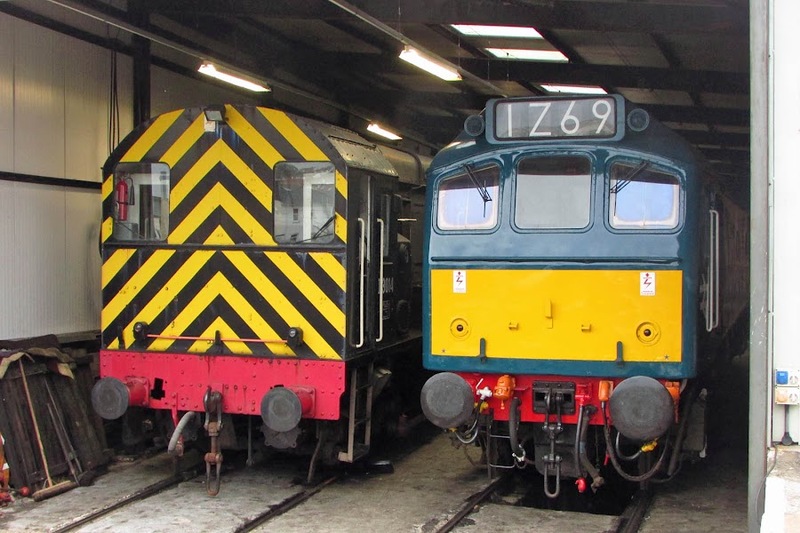 All is now reported sorted on both locomotives for Saturday 21st. A larger set appears on OneDrive. 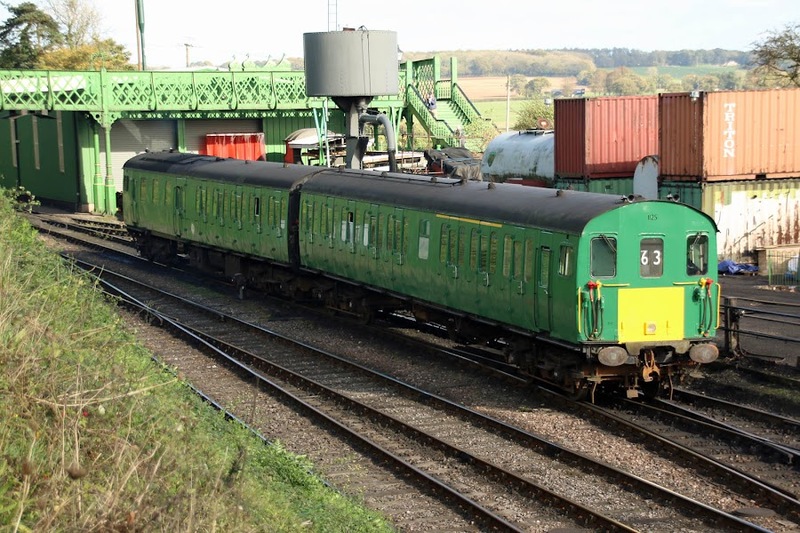 03197 at Alton with a Queen Mary brakevan shuttle. From late 1960s to mid 70s this was a SR loco, and was fitted with raised brake pipes for emu compatibility. Repaired D9002 (55002) King's Own Yorkshire Light Infantry preparing to join a train at Ropley. 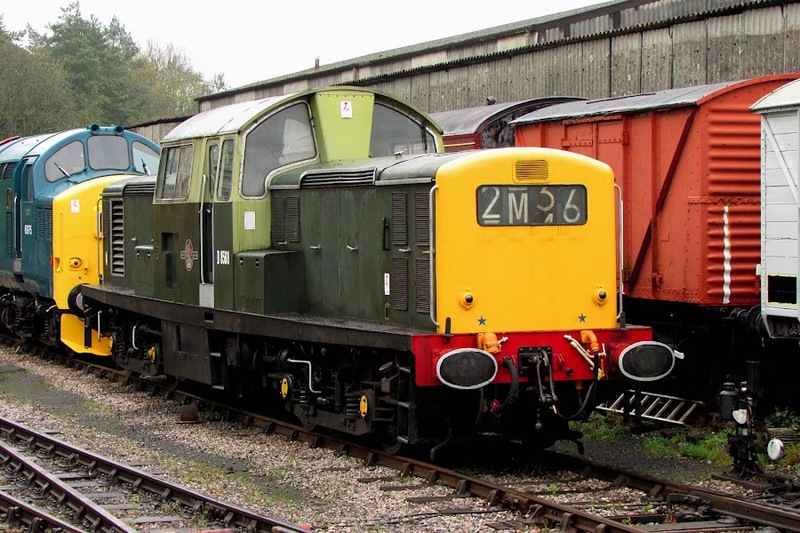 D6700 (37119, 37350) at Medstead. 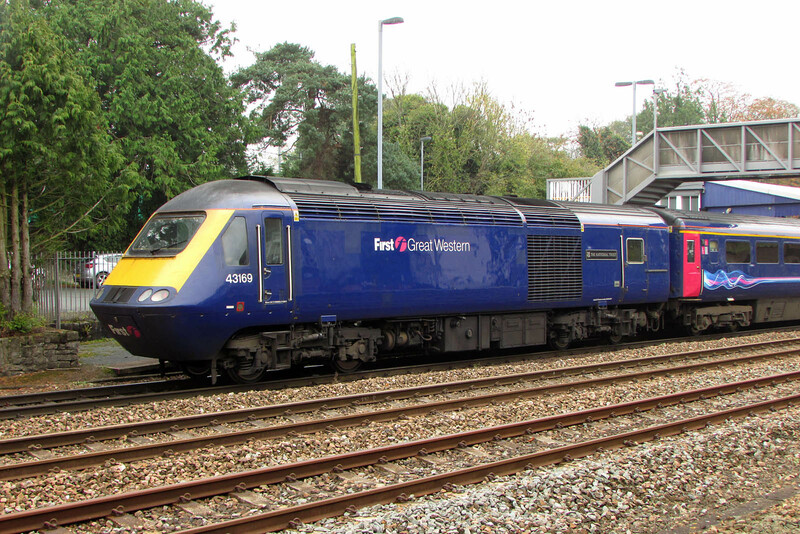 Full HST service in these parts are not forever, as some of the Great Western examples are to head to Scotland, and there will be IET sets. 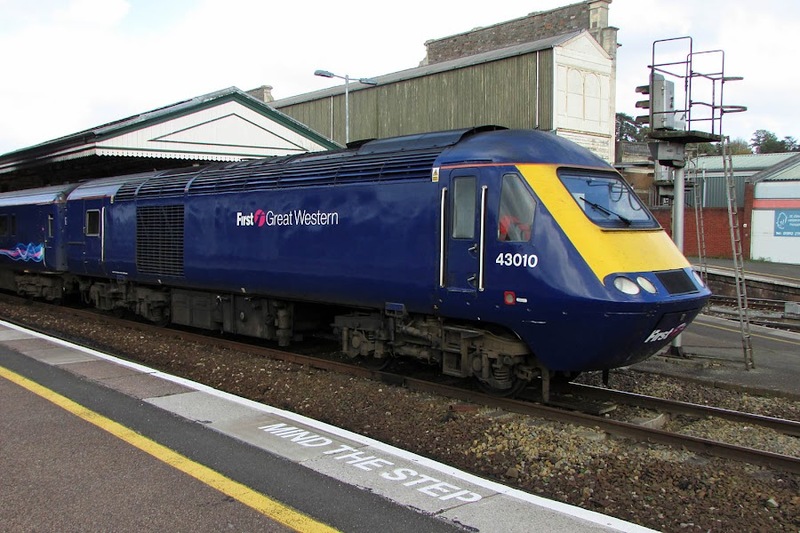 11 HST sets are planned to be retained by GWR. 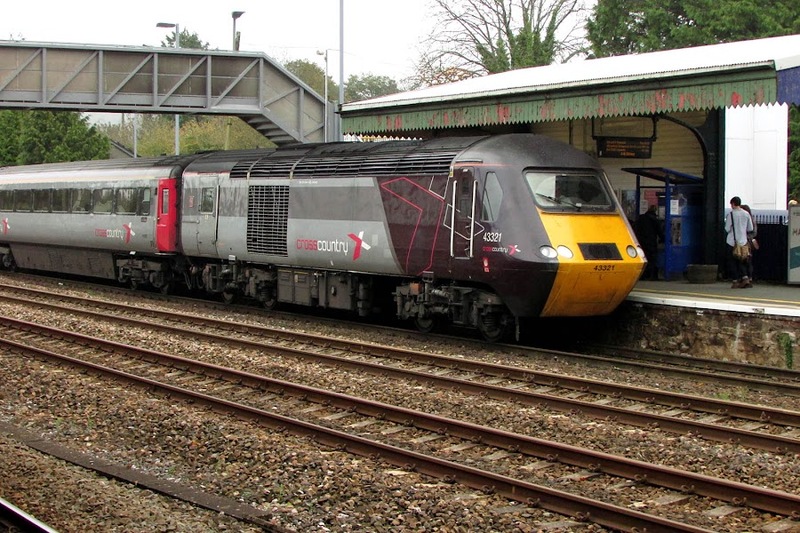 43169 at Totnes, 18th October. This example is on the list for Scotland. 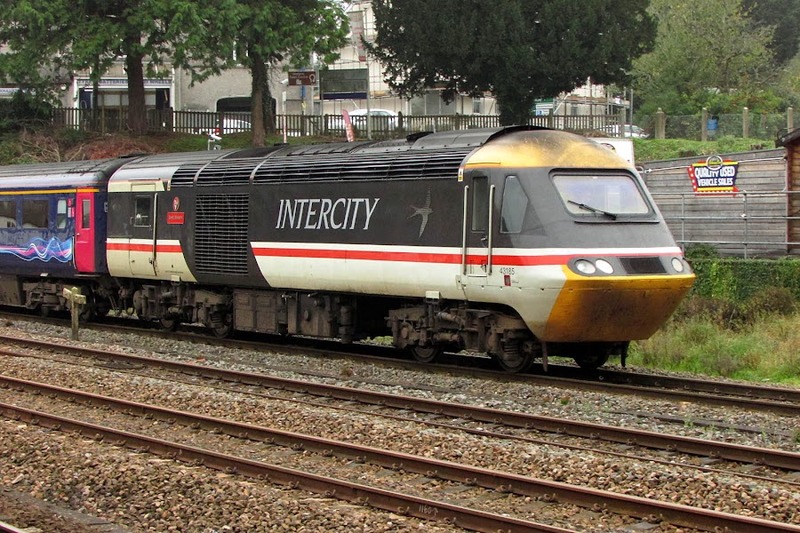 Retro livery on 43185, also at Totnes on 18th. Cross-Country 43321 again at Totnes. 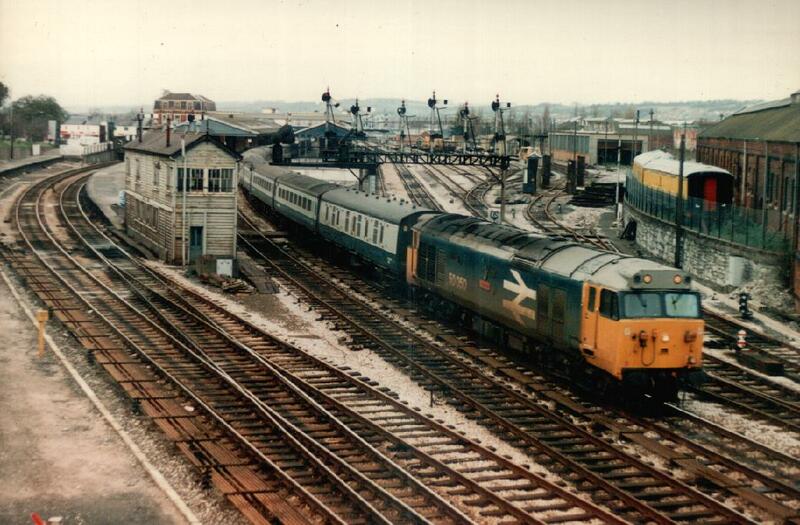 43010 at Exeter on 16th. 43016 and 43164 at Newton Abbot on 16th. 43164 is planned to go to Scotland. 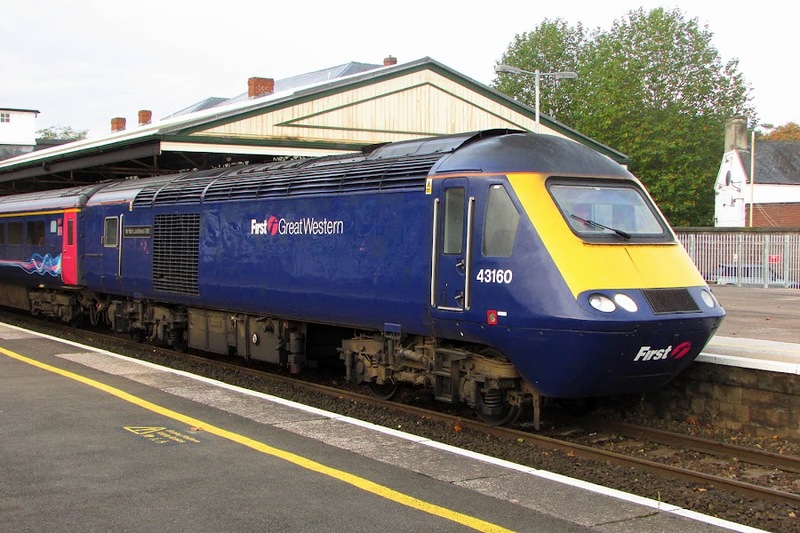 43160 at Newton Abbot on 17th. 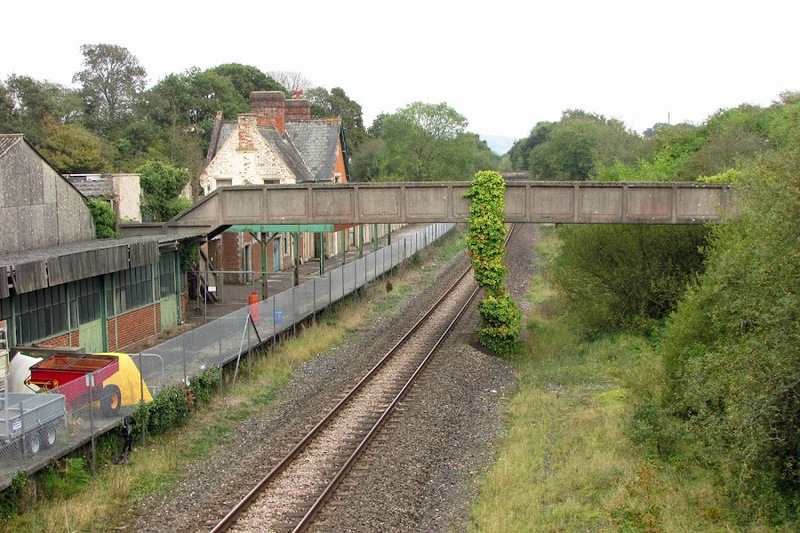 The 1928 concrete bridge spans to the second platform, on the right, which has a far curving edge for the Seaton branch. 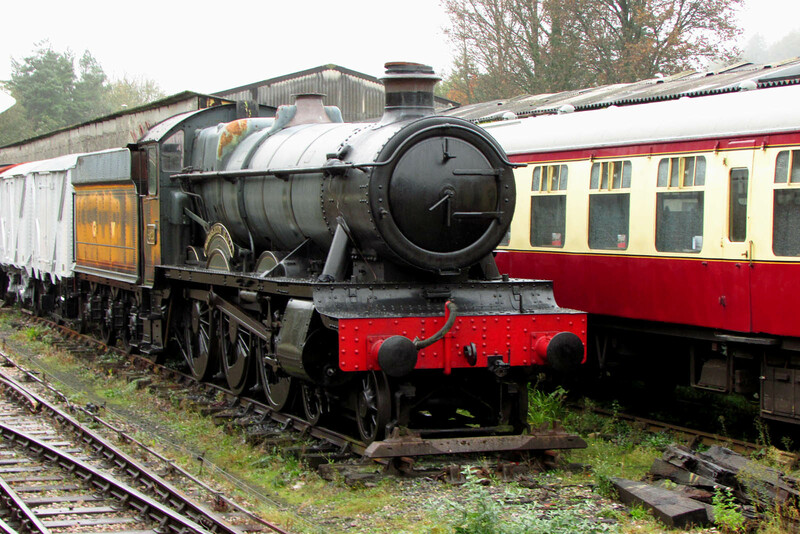 Gothic architecture by Sir William Tite for the LSWR. 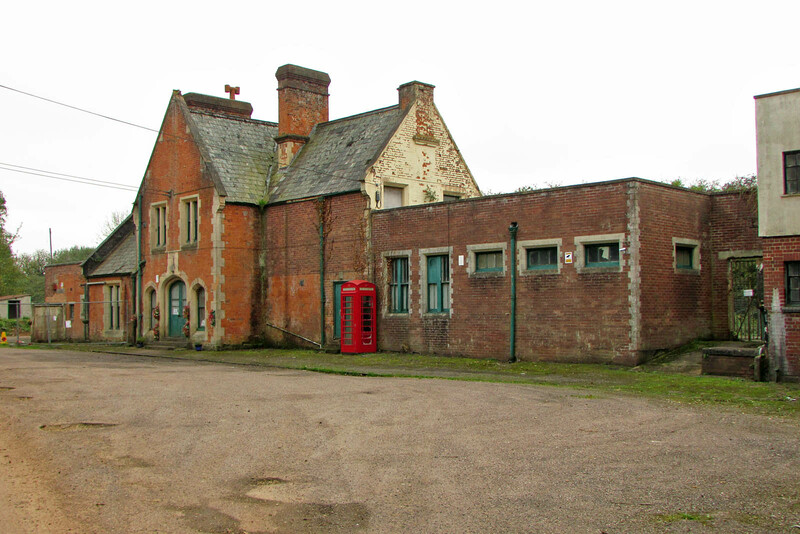 The station was closed in 1966, although the adjacent Express Dairies depot continued for some time afterward. The second Southern Railway pattern foorbridge carries a public footpath across the full width of the station. 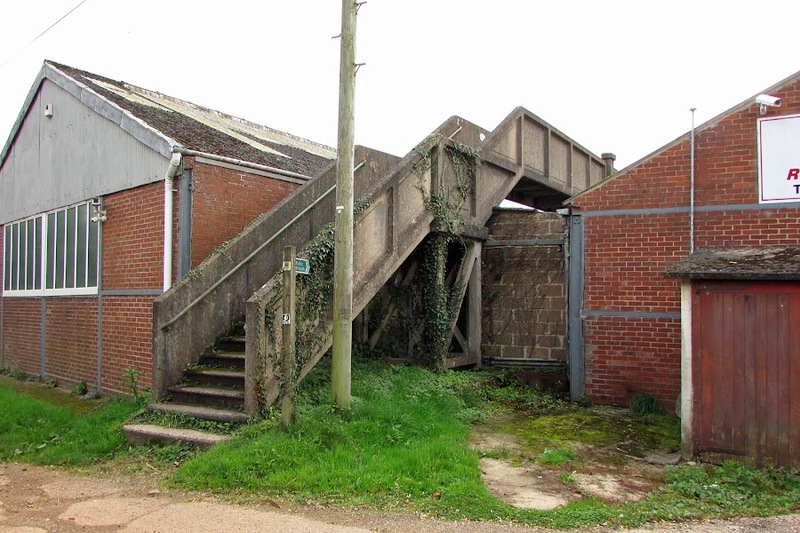 A further view of the station building with Southern Railway concrete fencing. Looking west towards Honiton and Exeter.